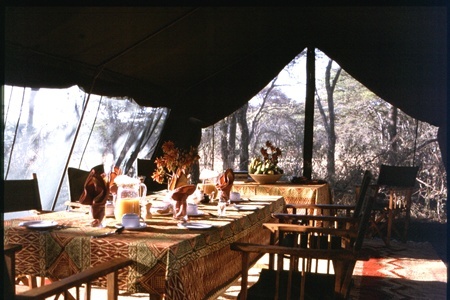 The Nomad Serengeti Safari Camp is located in the Serengeti Park and is best described as a 'semi-nomadic' safari camp, moving location according to the migration patterns of the wildebeest and zebra and offering you a 'front seat' safari experience. There are 12 spacious walk in Meru tents with a dressing room area separating the beds from the eco flush loos and bucket showers. There is hot and cold water available on demand. Each tent is located for privacy, but you are only a stroll away to the main guest area. 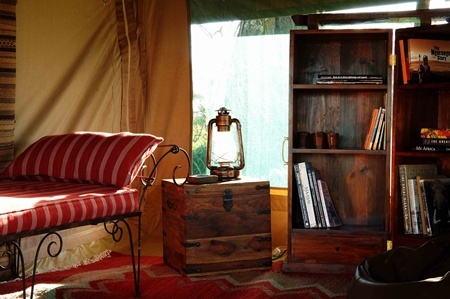 The camp is well equipped in simple elegance and caters for all the reasonable 'creature comforts'. The candlelit canvas mess is where everyone gathers and meals are enjoyed and then you can relax around the fire and share the stories of the days adventures. There is a separate library and lounge tent and a new dining tent. 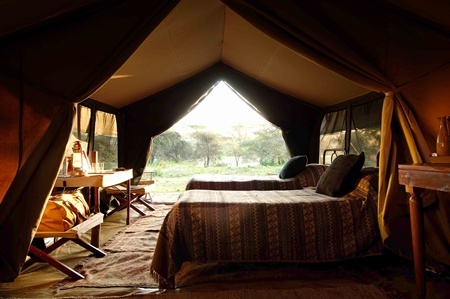 The Nomad Serengeti Safari Camp travels through the Serengeti National Park where the densities of animals and predators are high and is well positioned to the predicted path of the migration. The camp will not move during a your stay and there is total flexibility to plan daily activities according to clients interests. Camp movements are pre-planned in an effort to be within reach of the wildebeest migration, but this cannot always be guaranteed given the unpredictabilityof nature and weather conditions. Game drives are conducted in 4WD vehicles with your own private guide with daily game viewing as well as an abundance of birdlife. 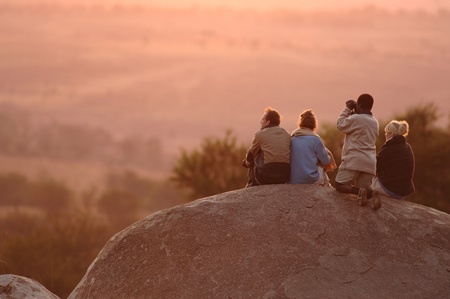 Your stay here allows you the best opportunity to see the great wildebeest and zebra migration, large herds of plains game and the highest concentration of predators in Africa. From December to April, the camp is on the southern Serengeti Plains with access to the main herds as they calve through February. Birding is excellent during this time, as is general game viewing. 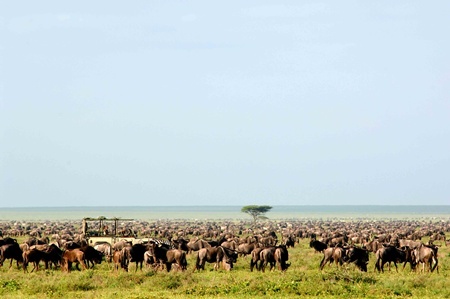 May to Early July, the camp moves to the Moru Kopjes area, central Serengeti Plains, and to the Western Corridor as the mass of the migration moves west and north. The migration patterns can be unpredictable at this time of year, but the wildebeest rut (May) and the crossing of the Grumeti River (June/July) are spectacular if caught. 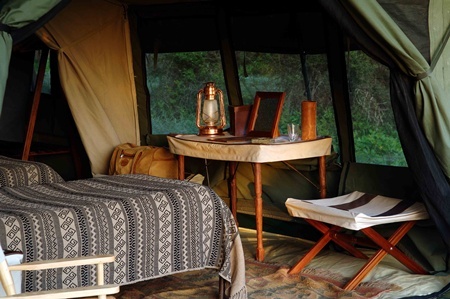 from Mid-July to November, the camp moves to the quieter northern Serengeti close to either the Mara or Bologonja Rivers, offering great game viewing and crossings of either of the rivers. 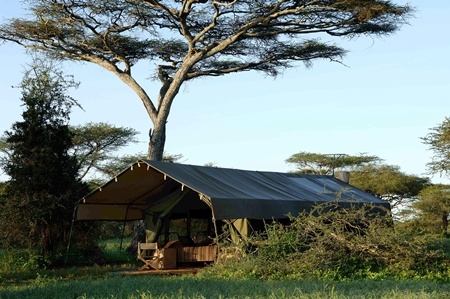 Towards late November the camp starts to head south again, arriving on the southern Serengeti Plains around mid-December. 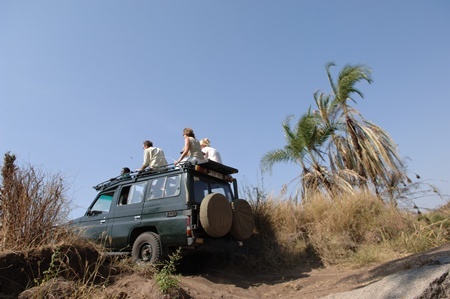 Access to the Serengeti Safari Camp is possible by private charter or schedule flights or you can take a 4WD safari vehicle. The nearest airstrips vary according to seasons, so best to leave these logistics to us when planning your safari holiday. Families with children over the age of 8 years are welcome at the camp and for safety reasons there is a restriction of 12 years on any walking or fly camping activities. It is the parents responsibility to keep children under their care, keeping in mind that this is an open game reserve where animals roam freely. Although there are boundaries for the Serengeti park, the ecosystem goes way beyond these limits, and is called the Greater Serengeti. It's a giant picture of wild Tanzania with masses of animals, contrasting land forms, and tribal peoples. The Serengeti Safari Camp roams around the lot in true nomad fashion. 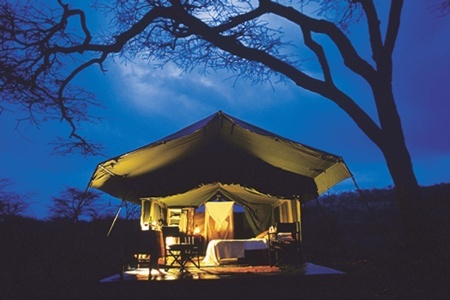 This camp is semi-nomadic - it won't move whilst you're there - but its actually on a wide orbit shadowing the migration; so you, your Tanzanian driver-guide and private 4WD vehicle are as close to a million wildebeest as possible. 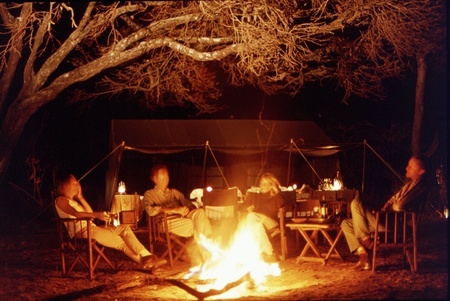 While you can head off from dawn till dusk on your own adventures, the small wandering camp is sociable because its shared - with guests staying in classic bush style.